In March I mentioned I’d be having a yard sale, my second in two years, and as you might imagine, I am up to my elbows in hangers, price stickers, boxes and I’m not sure what else at the moment. 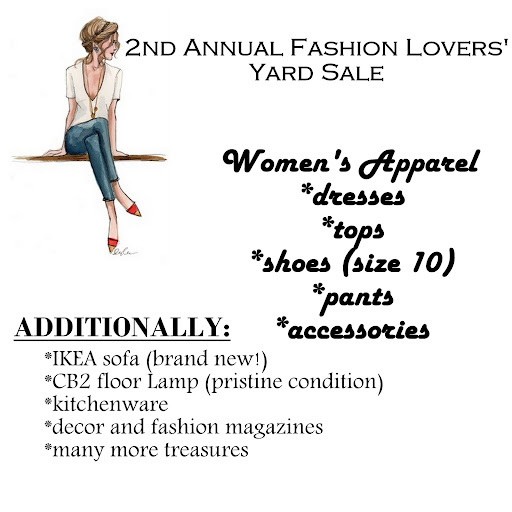 I must admit, I love organizing this mini event, so if you’re in the area on Saturday, take a look in the local paper for the 2nd Annual Fashion Lovers’ Yard Sale. What will bargain hunters find? Racks of clothing edited from my wardrobe, shoes, accessories, kitchenware edited from my Kitchen Facelift, a brand new CB2 floor lamp and a gray Ikea sofa with chaise lounge (click here to learn more). Other miscellaneous items as well – books, fashion and decor magazines and more. Myself along with my dogs – Norman and Oscar – will be looking forward to meeting you if you’re able to stop by and look for a few treasures. Speaking of wardrobes, this week’s posts included a revamp of a popular post revolving around shoes. With updated links and new additions, take out your checklist to see which of the 10 Essential Shoes you already have in your closet and which shoes to begin looking for. Also, Jamie Cat Callan just released her latest Ooh La La Francophile book which shares a French Woman’s Secrets to Looking Her Best Every Day – my copy just arrived yesterday and I can’t wait to read it. Those are just a few of the highlights from this past week. Here’s the rest . . .
~And this week’s newsletter – issue #155 – click here to read. Have a great weekend everyone, and if you too are considering having your own yard sale, click here to view a checklist to ensure a great event. Until Monday, bonjour.